This mountain is an impressive mass of red granite. The Great Black One, so called due to its dark brooding appearance is considered a massif with a "future". 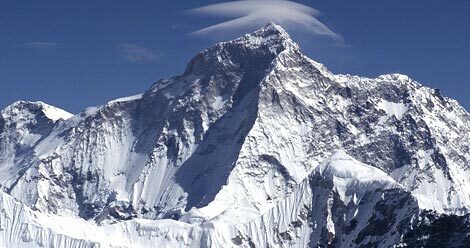 Makalu lies in the northeast region of Nepal and is a close neighbor to Mount Everest. Despite it being the fifth tallest among the eight sanders, the mountain is still virtually 'new'. A French Team led by Jean Franco in 1955 first climbed it.The French were the first to reach the Makalu summit back in 1955, an year after the Americans set off for the first ever attempt on the mountain. A British Expedition took valuable sighting and photographs of Makalu during the reconnaissance of the eastern approaches to Everest in 1921. Makalu has five routes and four variations along with other interesting opportunities like the West Face, the Northeast and North Flanks (Tibet). Our trek follows one of the most remote and unfrequented areas of Nepal. Starting at Tumlingtar plateau just above the Arun River, we walk through the snow, rain and cloud prone Kauma. Base Camp is just south of the snout of the Barun Glacier at an elevation of 4823m. It would be easy for you if you have your own group if not also we can arrange a group trek according to your request. You would be joining the group in Kathmandu. If you want to have a solo trip then we are always ready to help you again with single supplement charge. We try our best to make your comfortable holiday in the beauty of Makalu region. Climate in Nepal is diversified depends on season. From the low level to highest point of the World, it starts from hot to cold region from South to North. You can travel Nepal in any season but the best time to visit in Mahakalu region is autumn & spring. If you are in autumn the weather is perfect and sky is crystal clear but in spring the weather seem little cloudy but the full blossoming Rhododendrons are awesome. In Summer visibility is poor and there is less chances to see the himalayas and in winter it is very cold in mountain but still possible to do this trip. While you travel Mahakalu Region, you need to obtain the entry permits and TIMS permit. All the applicable permits and entry fees are including on the given cost except personal contribution and donations. In case of extra charge and payment, the agency will inform you. NEAT is highly aware with Environmental concern and keep right ecological system. There shouldn’t be awful impact while you travel around the Mahakalu region. So, we involve some campaign of cleaning trekking trails, works with KEEP project etc.